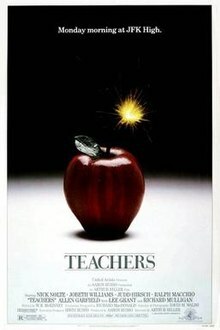 Teachers is a 1984 American satirical comedy-drama film written by W. R. McKinney, directed by Arthur Hiller, and starring Nick Nolte, JoBeth Williams, Ralph Macchio, and Judd Hirsch. It was shot in Columbus, Ohio, mostly at the former Central High School. On a typical Monday morning at John F. Kennedy High School in the inner city of Columbus, Ohio, there is conflict between teachers, a student with a stab wound, and a talk of an upcoming lawsuit. Vice Principal Roger Rubell, Principal Eugene Horn, and lawyer Lisa Hammond, who is in charge of taking depositions for the Calvin case, in which a recent graduate is suing the school for granting him a diploma despite his illiteracy. Alex Jurel is a veteran Social Studies teacher who takes his job lightly, despite being one of the most popular teachers in school because of his ability to identify and connect with the students. Jurel has been worn down by years of being in-between the rowdy students and the demands of the administration. He is assigned to temporarily take over the duties of the school psychologist, and meets a young man named Eddie Pilikian, to whom he becomes a mentor. During this time, a romance also develops between Jurel and Hammond, his former student. Other subplots include Herbert Gower, a wandering mental institution outpatient, mistaken for a substitute teacher and put in charge of a U.S. History class, whose brilliant history mind makes it fun, educational, and engaging; gym teacher Mr. Troy’s sexual relationship with a student that ends with Jurel taking her to an abortion clinic, and the death of Eddie's best friend Danny, a schizophrenic and kleptomaniac student who is shot and killed by the police after he draws a gun from his locker during a drug search. Superintendent Donna Burke and school lawyer Al Lewis are attempting to avoid bad publicity associated with the Calvin lawsuit. To prove this, they try to figure out which teachers will potentially damage the school's reputation in their depositions. The administration recognizes the threat Jurel poses to their social standing and forces him to resign before his deposition, ostensibly for helping the student obtain an abortion. After harsh criticism from Lisa, he finally stands up to Burke and Rubell, reminding them that the school exists for the students and not for the administration and protecting their jobs. He also threatens to sue and petition should he be fired. He proudly walks back into the school, with loud cheers from the school's students and Lisa looking on proudly. The film opened to mixed reviews, with reviewers feeling it lacked the incisive touch of Paddy Chayefsky's satires (he had previously written Hiller's other dark satire, The Hospital). On Rotten Tomatoes it has an approval rating of 62% based on 13 reviews. The theme song by 38 Special was released as a single and reached No. 25 on the Billboard Hot 100 singles chart. Understanding by Bob Seger reached No. 17. ^ Kehr, Dave (2010-02-17). "Teachers". Chicago Reader. Retrieved 2016-12-29. ^ Variety Staff (1983-12-31). "Teachers". Variety. Retrieved 2016-12-29. ^ Ebert, Roger (1984-01-01). "Teachers Movie Review & Film Summary (1984)". RogerEbert.com. Retrieved 2016-12-29. ^ Stone, Doug. "Teachers Original Soundtrack". AllMusic.